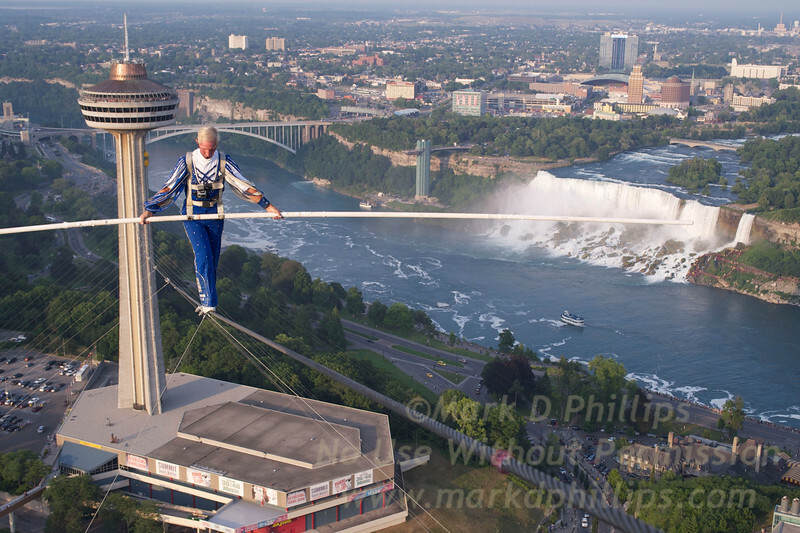 Jay Cochrane skywalks above the American Falls and Fallsview Avenue in Niagara Falls during the first performance of Skywalk 2012, the Greatest Building to Building skywalk in North American history. Cochrane will grace the Niagara skyline from the Skylon Tower (520 feet tall) to the top of the Hilton Hotel (581 feet tall) for the entire summer. At 1300 feet distance, he will cover approximately 30 Kilometers (20 miles) on this wire in the 81 scheduled performances.